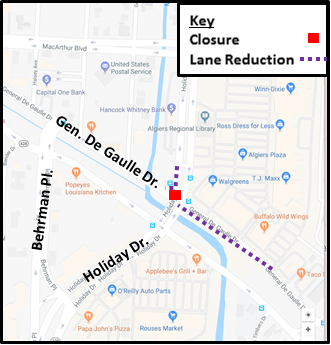 Beginning on Wednesday, Jan. 9, 2019, at 7 a.m., the City of New Orleans, Department of Public Works construction contractor, Hard Rock Construction, LLC, will close the south-bound lane of Holiday Drive at the intersection of General De Gaulle Drive. The closure will allow construction crews to repair a damaged bridge joint. Public safety is our top priority; residents and commuters are reminded to use caution when driving, bicycling and walking near this construction site. Drivers traveling south on Holiday Drive will be detoured onto General De Gaulle Drive and Behrman Place. Drivers traveling west on General De Gaulle Drive will not be able to turn left on to Holiday Drive; rather they will be re-routed to Behrman Place and General De Gaulle Drive. The detour is scheduled to be completed by the end of day Friday, Jan. 11, weather permitting. Signage and traffic control measures such as barrels will be onsite to direct drivers and pedestrians. NEW ORLEANS — Beginning on Wednesday, Jan. 9, 2019, at 7 a.m., the City of New Orleans, Department of Public Works construction contractor, Hard Rock Construction, LLC, will close the south-bound lane of Holiday Drive at the intersection of General De Gaulle Drive. The closure will allow construction crews to repair a damaged bridge joint. Public safety is our top priority; residents and commuters are reminded to use caution when driving, bicycling and walking near this construction site. Drivers traveling south on Holiday Drive will be detoured onto General De Gaulle Drive and Behrman Place. Drivers traveling west on General De Gaulle Drive will not be able to turn left on to Holiday Drive; rather they will be re-routed to Behrman Place and General De Gaulle Drive. The detour is scheduled to be completed by the end of day Friday, Jan. 11, weather permitting. Signage and traffic control measures such as barrels will be onsite to direct drivers and pedestrians. For questions and/or concerns about the project, please contact RoadworkNOLA at 504.658.ROAD (7623) or send e-mail to roadwork@nola.gov.